Portable miter saw stands are designed to quickly deploy in seconds, transforming any garage or driveway immediately into a practical workshop. Broadly, they are designed to work not just with miter saws, but with benchtop planers, and scroll saws with their universal machinery mounts. Some, like the HTC PM-700 are feature-rich (think work lights, power strips, storage compartments), while others are simpler and less expensive like the HTC PM-4000. Users we spoke to say that they cut project time by a third using a miter saw stand, as opposed to operating it from the ground. The DeWalt rolling miter saw stand was the best-received stand that we examined- it features a broad adjustable infeed and outfeed, and provides 8 inches of material support. The adjustable mounting rails enable it to adapt to any type of miter saw with wide-gripping rubber wheels making it a cinch to transport around job sites. Extended Width: Extended: 98 inches; Extended Height: 32.5 inches; Folded Width: 59.5 inches; Folded Height: 17 inches; Weight: 67 pounds; Shipping Weight: 75 pounds. One buyer that we spoke to only had high praise for this miter saw stand. He says that as a home builder, the stand has become an indispensable tool in his work arsenal, cutting project time a third in comparison to having the miter saw on the ground. Let's take a look at 5 of the best-selling miter saw stands on the market today. This miter saw stand with wheels offered by Hico is inexpensive, convenient and useful for do-it-yourself projects. Users love the easy assembly process, but some do note that the extension bars are square and don’t fit well into the round main support bars. With a size of 42.3” x 9.3” x 9.2” and a weight of 31 lbs, this miter saw station has durable tubular steel constructions, an operating height of 33.3 inches, a maximum extension of 114 inches and 20-inch quick attach tool mounts. This folding miter saw stand is suitable for all brands of miter saws and it has a 500-pound weight capacity. In general, users have a mixed opinion regarding the Hico folding miter saw station with wheels. A satisfied buyer shares that the miter saw table arrived in perfect condition and it required only minor assembly. The reviewer also states that the stand is stable, solid and his miter saw fits perfectly. Another happy customer mentions that his father uses this foldable miter saw stand daily and that he is pleased with its lightness and portability. The reviewer comments that it’s very easy to mount the saw and it fits securely. On the other hand, unhappy buyers have complained that this rolling miter saw stand is too unstable because the base is too narrow to support the saw and that the folding legs are difficult to operate. A customer warns that it’s dangerous to move this miter saw table with the saw still attached because it could tip over. This rolling miter saw table offered by HTC is well-balanced, well-design, practical and suitable for miter saws, portable planers, small band saws and scroll saws. Users love the extra accessories, but some do note that it’s overpriced. With a size of 67” x 10” x 12”, this power tool stand has rust-resistant tubular steel and aluminum construction, a weight capacity of 500 lbs, a 33-inch working height, storage compartments, quick attach mounts, and a maximum extension of 116 inches. The package also includes a four-outlet 110v power strip, a work vise, a work light, 8-inch wheels and three adjustable work supports. A user mentions that this miter saw power tool table is versatile, reliable and easy to move around thanks to the wheels. The reviewer also comments that the vise is adjustable, heavy- duty and of exceptional quality. Another buyer states that this is one of the most stable miter saw tables that he has encountered and that the power strip is very handy, especially for low amp tools. He also says that he has been using this miter power stand for about a year without any complaints and he fervently recommends it. A happy purchaser also shares that he assembled the stand for about 30 minutes and that his father-in-law regularly uses it to build shelves, cupboard, and plant stands. However, customers have complained that it’s nearly impossible to move this miter table safely with a heavy saw attached and that the quality of the extension arms is cheap. Some also note that the package arrived poorly packed, and the work light was broken. 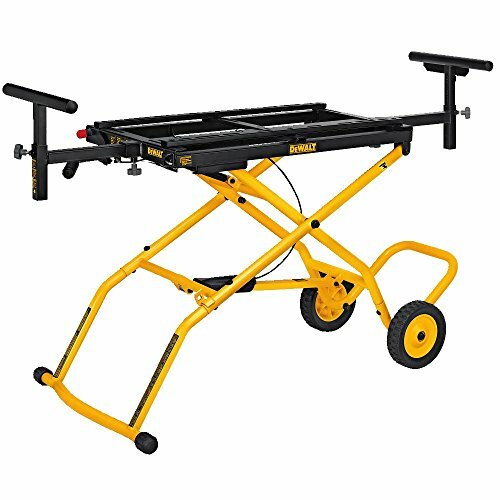 If you are looking for a top-rated rolling miter saw stand, you might want to consider this foldable miter saw table offered by Dewalt. Users love the high-quality construction, but some do note that the instructions are hard to comprehend. With a size of 60” x 17” x 10” and an extended length of 98 inches, this portable miter saw stand has adjustable infeed and outfeed work supporters, adjustable mounting rails, rubber wheels, and three-position pneumatically assisted raising and lowering. It’s made of durable tubular steel construction, and the maximum weight capacity is 300 pounds. A purchaser comments that it’s a real pleasure to use this portable miter saw table, and he makes precise cuts quickly and effortlessly, so his job is easier than ever. Another satisfied user mentions that the Dewalt rolling miter saw stand is well-built, stable, and easy to assemble. The reviewer states that it took him no more than 40 minutes to set-up everything and to start cutting. A happy buyer also shares that he can roll the stand with the saw attached without worrying that the Dewalt saw stand would fall and that he can easily store the table when he is done. However, some customers have complained that the miter saw table they received doesn’t match the provided description and that it’s not very easy to lower or raise the table. Some users also mention that the miter table was missing hardware and parts upon arrival and that it’s too short. This foldable miter saw stand offered by HTC is easy to set-up, well-made and an excellent choice for anyone that wants a stout miter saw table. Users love the price and the quality, but some do note that the wheels are sold separately. With a folded size of 44 x 10.2 x 6.1 inches, this miter saw station is made of rugged tubular steel, and it has a weight capacity of 500 lbs, adjustable 13-inch material support arms, 20-inch quick attach tool mounts, a working height of 36 inches, and snap pin folding legs. In general, users are extremely satisfied with the performance, stability and durability of the HTC fling miter saw table. A buyer comments that he didn’t expect such a high-quality product because of the low cost, but the stand holds his 10-inch miter saw with no issues. He strongly recommends the HTC saw table to anyone that wants an inexpensive miter saw stand. Another happy customer shares that the legs fold up easily and it’s so light that it’s no effort to carry it around. The reviewer also states that it’s a piece of cake to attach the saw thanks to the release handles and that he has been using it for a couple of months with no signs of wearing or damage. However, some customers have complained that the extension arms will sag if they have to support heavy material and that the package arrived without all the necessary parts and hardware. Some users also complain that the locking handles broke during the assembly process and that it’s awkward to fold the legs. 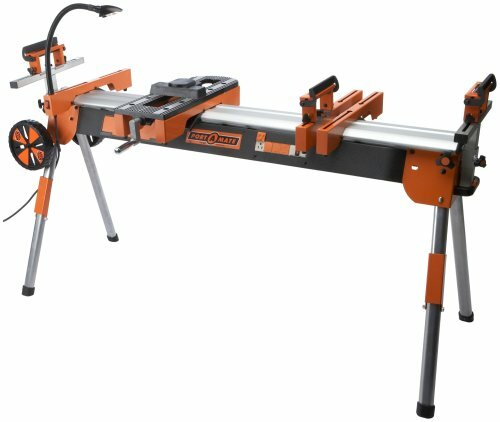 This heavy-duty portable miter saw table offered by Hitachi is reliable, stable and easy-to-to fold. Users love the easy set-up process, but some do note that the instructions for assembly are unclear. This portable miter saw station has a size of 52” x 31” x 37”, extendable material support arms, quick-release mounting brackets with non-marring rubber feet, auxiliary mounting brackets, adjustable material stops, 8-inch wheels and extended work support up to 95.5 inches. You don’t need any tools to adjust the height of the material supports, and it accepts up to a 12-inch sliding compound miter saw. A buyer shares that this portable miter saw table is steady, well-built, and it holds the weight of his 12-inch compound without sagging. The reviewer also says that it’s incredibly easy to fold the stand and roll or carry it around. Another customer mentions that the Hitachi heavy-duty miter saw stand was delivered in perfect condition and he was very surprised by the stout construction. 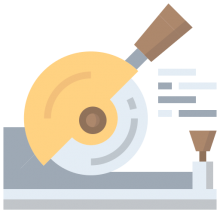 The user also states that the wheels are sturdy, adequately sized and durable and that he has no problems to leave the saw attached to the table for days. A happy purchaser says that the miter saw can be connected and disconnected relatively quickly and that it takes him several minutes to set-up everything and to start cutting. However, some customers have complained that it’s not recommended to move the table with the miter saw attached or leave the saw on it when you are not using the stand. Some users also complain that the miter stand arrived damaged. 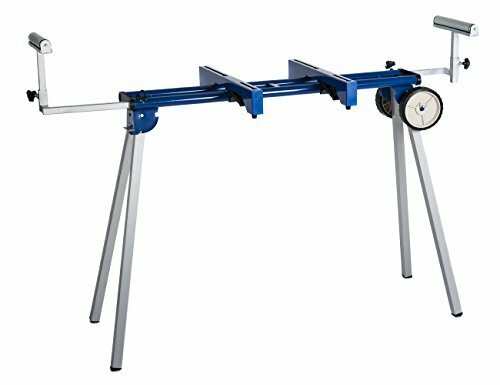 The Hico folding miter saw stand was the first that we took a look at- it promises a universal design that can accommodate any type of miter saw, wheels to make maneuverability easy, 20-inch attaching tool mounts, easy to snap folding legs, and a rugged tubular steel build that provides a weight capacity of 500 pounds. There were some mixed reviews for this particular folding miter saw stand- with one buyer saying that it was easy to assemble, worked right away and it was a perfect fit with the attachments. Because this contractor goes to many different job sites, its mobility enabled him to cart it around, and it was always simple to assemble and then pack up once he was done. However another reviewer says that the manufacturers skimped on several important features. In particular, he is critical of the wheelbase which he says is way too narrow to support heavier tools without flipping over when it is moving around. The Hico stand another reviewer told us is dangerously unstable and it has the potential to completely destroy your mitre saw if it takes a fall onto a hard surface. This user not only had trouble transporting it with the saw attached, but even when it was sitting on a level surface, if there were any imperfections on that surface, the stand became heavily unstable. This is a relatively inexpensive miter saw stand, so you really are getting what you pay for here. The HTC folding miter saw stand was another option that we examined- the manufacturers say that it is their top-of-the-line portable stand and features a 4 outlet 110 V power strip, work vise, work light and 8 inch wheels. In addition, it also includes storage racks attached to the front legs, storage compartments and the manufacturers say that it quickly mounts any and all bandsaws, planer saws, miter saws and scroll saws. The company also says that it is an ideal workbench for contractors and DIY hobbyists- being able to accommodate basically any make and model of miter saw. Reviews are fairly positive for this folding saw stand, with one buyer telling us that it is feature-rich and highly versatile. He enjoyed the 8-inch diameter wheels, the built-in power strip, the three adjustable material supports that include handy integral stops, and its lightweight construction. In addition, the storage compartment is great for tucking small items and the vise that comes included is heavy-duty. Another reviewer, however, had a negative experience- he says that he purchased it to use with a Hitachi saw and after several uses the right leg lock broke. As well, he had trouble maneuvering it, and ultimately concluded that it was not functional as a portable miter saw stand- saying that whenever he tries to move it the leg brackets dig into the ground and it becomes extremely difficult to transport. However, another buyer who is a home woodworker endorses this stand saying that it is rugged enough to be used on a variety of different job sites but also pretty portable. As other reviewers have said, the extra features really pushes the stand over the top, making it into a truly dynamic workstation. The extra storage capacity, power strip and lighting capabilities mean that it performs as a indispensable workstation for general contractors, construction workers and DIY hobbyists. Regarding some of the other negative comments, this reviewer told us that in a lot of cases people do not know how to properly assemble and even use the miter saw stand so their criticism is unwarranted. The DeWalt rolling saw stand was another solid option- its easy-rolling rollers make it simple to perform a series of cuts rapidly, keeping it effortlessly moving, and if you were looking to do a length stop all you have to do is raise the roller around an inch and the surface beneath the roller provides for a perfect stop. This reviewer also praised the quality of the wheels- he told us that they are solid rubber, but not rock-hard, meaning that when you are transporting it the wheels provide a little bit of cushioning when they go over hard edges. As well, because it is constructed from steel, this is a particularly heavy miter saw stand, but on the positive side this makes it reliable, if somewhat rigid. In his experience, it is able to mount the majority of miter saws on the market and could probably accommodate most of the portable planers, as well. The fasteners and adjustments will can be done using an 8 mm Allen wrench- and for your convenience this can easily be stored on board the work cart itself. Another reviewer that we spoke to said that it is truly portable, easy to set up, raise and lower, and is pretty convenient to store in an upright configuration. However, he did reserve some criticism for the stabilization rollers, saying that it is a bit difficult to get them to the correct height if you are dealing with different material weight. He advises novice users that this stand is not engineered to be used for particularly heavy weight material- it requires more support for its extension arms when they are fully extended. Another buyer decided to purchase this to combine it with his Dewalt sliding miter saw- saying that this is the sort of set up he had been dreaming of for several years. In general, he is pleased with this portability, saying that as a rolling stand it is easy to collapse, but he does advise buyers to purchase stationary models if they are just using it inside of their woodshop. While overall he considers this a great work stand, he does say that there are a few things he would change. One issue he had is that some of the bolts that came with the stand were improperly threaded- he was able to get replacements easily, but he was disappointed by this. As well, he was critical of the included instructions- he says that DeWalt should have included diagrams to help guide set up. Another issue is that you need to be careful to wrap the cord after you have collapses saw otherwise when it collapses you could end up punching and potentially damaging it. Another HTC stand we took a look at was the PM-400 work-stand. 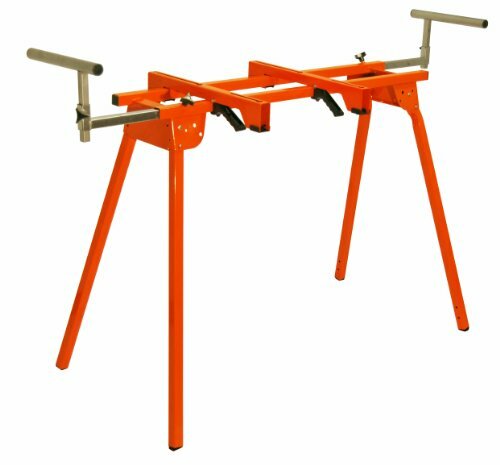 This 500 pound capacity, 36 inch work height saw stand is contractor-grade with powder-coated steel finish. HTC says it that it is engineered to adapt to nearly any type and model of a miter saw, providing you a durable and rugged stand that will safely and easily assemble to provide a stable surface for you to work with. One buyer we spoke with who was highly impressed by this stand said that on the positive side the construction quality is exceptional, it arrived nearly completely assembled, the packaging was easy to open, hardware was included for different styles saw bases, and it is a lightweight but stable stand. On the other hand, he wish that there were some other color selections available and it would be ideal, he thought, if the stand were configurable for height as says that if you are over 6 foot three or below 5 foot it may not be perfectly sized for you. He uses it to transport the saw while it is attached, and finds that it is not too difficult to transport this way and says that in essence it is a simple and sturdy long saw stand. Another buyer said that it is a simple stand, much cheaper than the DeWalt stand, but as other users have unfortunately experienced there was some minor damage that was incurred during shipping that required him to do some handiwork to correct. Another reviewer we interviewed told us that while he hasn't used it for anything weighing close to 500 pounds, he is confident that this heavy workstand could withstand that weight. 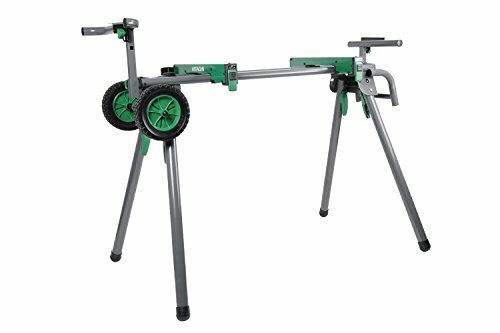 The last portable miter saw stand that we took a look at was the Hitachi rolling saw stand- it comes in two different models, one that is portable with wheels and one that is fold and roll. It features a 400 pound weight capacity, material support extensions that extend 8 feet for longer material support, can accept 12-inch sliding compound miter saws, height adjustments without tools, its rubber feet are non-marring to ensure it doesn't cause any surface damage, and material stops are installed to be adjustable for easy repetitive cutting. One buyer we spoke with said that it is well-engineered, sturdy and a solid value purchase. While the instruction manual says that you should not stand it on its end when storing it, store it with a saw attached to it, or even move it around with the saw attached, this buyer says that it appears that it is actually engineered to do that. One handy feature this buyer appreciated is that it ships with an anchor plate leg attachment so that you can screw it to the floor or stake it to the earth when you are using it for maximum stability. He does caution new users that you should not try bringing it up or down stairs with the saw attached- saying that ideally this is for a DIY home hobbyist or remodeler and not for a general-purpose commercial construction worker. If you are in the market for a portable miter saw stand, make sure you distinguish between cheaper models that in general are not rugged enough and are more suited to residential applications, and heavier-duty stands that are better suited to commercial applications.